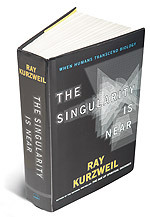 For over three decades, the great inventor and futurist Ray Kurzweil has been one of the most respected and provocative advocates of the role of technology in our future. In his classic The Age of Spiritual Machines, he presented the daring argument that with the ever accelerating rate of technological change, computers would rival the full range of human intelligence at its best. Kurzweil examines the next step in this inexorable evolutionary process: the union of human and machine, in which the knowledge and skills embedded in our brains will be combined with the vastly greater capacity, speed, and knowledge sharing ability of our own creations. That merging is the essence of the singularity, an era in which our intelligence will become increasingly non-biological and trillions of times more powerful than it is today—the dawning of a new civilization that will enable us to transcend our biological limitations and amplify our creativity.